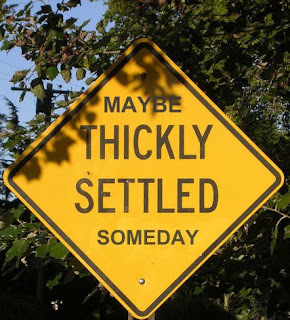 Thinking Out Loud In Sturbridge: Maybe. Someday. It's been two years. Two years since I sat down with Traffic Safety Committee, and expressed my concerns for the vehicle speeds on Route 148. I didn't hear a word from the committee, or the Chief for one year. Then, I was contacted after I wrote about it. The radar speed detector was then placed on the road for a couple of weeks in each direction. I was told the information obtained was not the best (it was December, and snowy),and the radar board would be put out again in the spring of 2008. In mid June it was set up once again. I wrote to the Chief about the data the speed board had obtained, and he asked for my telephone number so that he could review the data with me. It's been two months, and still no call. I am a patient man. Too patient according to some, and I realize that things do get in the way. But, it's been two years. I had originally asked that the first half mile to a mile of Route 148 be made a 30 MPH "Thickly Settled" zone, and I was told that they would have to go back into the old Mass Highway records to confirm the measurements between the houses. You see, in Massachusetts to be a Thickly Settled zone you have to have houses less than 200 feet apart for 1/4 mile. To tell you the truth, I never did understand the rationale for going back into old Mass Highway records. I have a tape measure, and an odometer in my vehicle. I know the distance between the houses, and the mileage. It qualifies, but I could wait. Currently there are only yellow speed limit signs. According to the Mass General Laws, and the chief, yellow speed limit signs are merely suggestions, and unenforceable. A police officer can issue a ticket for driving at a speed that is not reasonable and proper for the road, or situation, but I have only seen a cruiser sitting on this section of Route 148 once. Once in two and a half years. This past week alone I have witnessed vehicles traveling at greater than 60 MPH, especially heading north on Route 148. Some are going much faster. Much, much faster. Late yesterday afternoon, two motorcycles were coming up the road northbound when they began to accelerate. Suddenly, the lead bike popped a wheelie and held it past my house, the next house, and as far as I could follow him. Great wheel stand. Inappropriate for the street, but nice. I listened for the engine to drift off in the distance. It did. There was no sudden loss of sound coming from that whining motorcycle. Thank God. If the sound had stopped it could only mean one thing. I've seen enough accidents. I listen for that silence everyday on this road. So, here's bottom line. I expressed my concern for the excessive speed some drive on the road to the Traffic and Safety Committee. The Chief took the ball. I spoke with my neighbors, and they all agree the speed limit needs to be set for a Thickly Settled zone, and more enforcement is needed. Whatever it takes, the Town needs to do it now. Not in two more years, or two more months. There is going to be a tragedy on this road, and with school reopening, the chances that a newer driver will be involved will skyrocket. I have written about this issue enough, and probally will again someday, but for now it is out of my hands. I have put it out there, here on this space, in person, and on the phone. The ball is now in the court of those in power to act, and they have not acted. Their choice, but it is on the record that they have been told. When something does happen on this road, and it will, I will not be an "I told you so". "Route 148 South" (Brookfield). Most complained about speeders on the street. It's not just the Sturbridge end of Route 148, it's the entire length of it up to Rte 9, which intersects there with a very weird street layout and intersection. I live on New Boston Rd; it's like a speedway. And now that the gravel project at the rod & gun club is approved, it's going to get more noisy, messy and dangerous. Police have been placing speed traps on this street forever. It works well when it's there. It's a constant presence. So, what are the choices after police do their thing, signage is installed and residents still complain? Move. This is why many people buy houses on a cul de sac or dead end street: so their kids and animals can be safe, and they don't have to put up with traffic noise, small and other disruptions to their quality of life. Speeding is an issue no matter where you live. I live on a dead end, dirt road off of New Boston Road. People speed down the street at 40 to 50 miles an hour daily. Even through our road is classified a public road, ATVs speed down in the summer and snow mobiles speed down in the winter. I have narrowly avoided being hit by cars as I walk my dog. I believe the issue is related to a lack of respect for others and that belief that the rights of the individual outway what is best for the neighborhood or the community. I probably sound like an elderly person, but I was raised to think about how my actions effect others and to obey the law. No matter where you live, there are individuals who will have an impact on the quality of your life. Here's a funny story about cameras being installed in intersections: when on our usual Arizona vacation with the inlaws one year, we always rented one vehicle which the 4 of us would drive, but we took turns each year charging it to our credit cards. One year after returning from the annual vacation, we received a $150 invoice in the mail from the Phoenix police for speeding. We proceeded to call the inlaws and said we were sending them the invoice, and to please pay it promptly as the rental vehicle was rented in our names that year. The inlaws weren't gracious - they were highly insulted and flatly stated they wouldn't pay it because...why would WE assume it was them who had broken the law?? That's the nice thing about cameras at intersections: they zeroed right in their faces in the vehicle - there was no mistaking it was they who were speeding! I highly recommend cameras at intersections!